The Alta Mesa/Glenwood Circle neighborhood of Monterey is a very desirable neighborhood to call home, with excellent proximity to downtown as well as Hwy 1. Nestled in the sunbelt of Monterey, the area has pleasant weather with clear sunny days, removed from the fog. Homes are also situated on large lots, allowing for gracious outdoor living and privacy. In addition to single family dwellings, you will find condo living available in “Footprints on the Bay” located on Glenwood Circle with an indoor pool and private patios. There are monthly association dues associated with ownership in this complex. The neighborhood is bordered by Munras Avenue and Don Dahvee Park to the West, Aquajito Road to the East near the Del Monte Golf Course, Fremont Street to the North near Lake El Estero and open space to the South. The neighborhood is home to Monterey Peninsula College and La Mesa Elementary School and La Mesa Youth Center as well. Residents belong to the Monterey Unified School District. There are numerous parks and open space to enjoy including the Don Dahvee Green Belt and the Iris Canyon Green Belt which meanders around beautiful Lake El Estero. The neighborhood also boasts the Monterey State Historic Park which is a must see. The Monterey State Historic Park located at the western end of the neighborhood is a collection of homes and buildings that are historically significant to the city of Monterey and the state of California. As you may or may not know, Monterey served as the state capital under Spanish, Mexican and U.S. military rule and On July 7, 1846 the United States flag was first officially raised in California this very city. The interior of the majority of the adobe buildings can only be viewed on a docent led tour, but it is a tour well worth taking. Without a docent you are free to discover the site where Spanish explorers first landed in Monterey in the year 1602. Step back in time as you walk the same streets as Robert Louis Stevenson walked in 1869 and see one of the last remaining whalebone sidewalks in the country. The “Path of History” will lead you to a number of sites while surrounding you with beautiful landscaped gardens. It is interesting to note that The Customs House is the oldest government building in all of California. 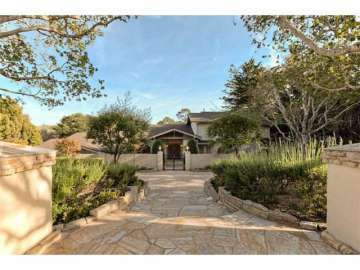 Click here to view all homes for sale in the Alta Mesa/Glenwood Circle neighborhood of Monterey. For all available Monterey real estate, click here. In 2018, 24 homes sold in this neighborhood. The most expensive home to sell sold for 2.1 million for a 4 bedroom, 3 full and 2 half bathroom home with 4,084 SqFt of living space on a 20,994 SqFt lot. The least expensive home sold for 317K for a 1 bedroom, 1 bathroom condominium with 590 SqFt. In 2017, 28 homes sold in this neighborhood. The most expensive home to sell sold for 2.2 million for a 4 bedroom, 3.5 bathroom home with 3,423 SqFt of living space on a 25,300 SqFt lot. The least expensive home to sell was a 2 bedroom, 1 bathroom, 950 SqFt condominium that sold for 950K. In 2016, 17 homes sold in this neighborhood. The most expensive home sold for 1.791 million for a 3 bedroom, 3.5 bathroom home with 3,769 SqFt of living space on a 32,670 SqFt lot. The least expensive home to sell sold for 259K for a 1 bedroom, 1 bathroom condominium with 630 SqFt and was part of the Monterey affordable housing program. In 2015, 22 homes sold in this neighborhood. The most expensive home sold for 1.712 million for a 4 bedroom, 4 bathroom home with 3,490 SqFt of living space on a 32,000 SqFt lot with detached guest house. The least expensive home sold for 135K for a 1 bedroom, 1 bathroom, 676 SqFt condominium. In 2014, 10 homes sold in this neighborhood. The most expensive home sold for 1.997 million and was a 4 bedroom, 3 bathroom home with 4,399 SqFt of living space on a 38,700 SqFt lot. The least expensive home sold for 242K and was a 1 bedroom, 1 bathroom, 630 SqFt condo. In 2013, the most expensive home sold in the neighborhood was a 5 bedroom, 4 bathroom Ocean view home with 3,421 SqFt of living space on 29,500 SqFt lot and sold for 1.45 million. The least expensive home sold in 2013 was a 950 SqFt townhouse, which sold for 160,898. In 2012 there were 12 home sales in the neighborhood. The most expensive home sold for 1.225 million and was a 4 bedroom, 3+bathroom home with 3,389 SqFt of living space and was situated on a large 32,900 SqFt lot. The least expensive sale was a 1 bedroom, 1 bathroom condominium with 590 SqFt of living space and sold for 165K. For a detailed analysis of Monterey real estate sales, check out our monthly Community Market Reports. To live in the coveted neighborhood of Alta Mesa/Glenwood Circle is to live in the sunbelt of Monterey with fantastic proximity to the heart of historic Monterey and endless opportunities for recreation along the bay. If you choose condo living you may enjoy mornings spent on your private patio enjoying the morning sun and fresh air. With homes having generous lots you may enjoy working in the garden, or enjoying the privacy of your home on your sun filled outdoor deck. Afternoons spent at El Estero Park will delight children as they feed the geese and play for hours on the various play structures at the Dennis the Menace Playground which has numerous slides, rock climbing wall, a maze, an adventure ship and more. There is fun for everyone at El Estero with a skate park, outdoor exercise course around the lake and bright colorful paddleboats to take out into the sparkling waters and check out the birds. Across Del Monte Avenue you will find the Monterey State Beach, the Marina and the Wharf where you can watch the fishing boats come in as well as nearby Cannery Row which is rich in history with many shops, restaurants and sight-seeing opportunities. Adding to the convenience of the neighborhood is its close proximity to Hwy1 which is great for commuters as well as for southern adventures into Pebble Beach, Carmel and Big Sur communities. Cyclists, walkers, kayakers and divers will love the ideal Monterey Bay locale and golfers will enjoy neighboring Del Monte Golf Course which is a challenging yet relaxed course to spend sunny days on with lunch alfresco afterwards at the Del Monte Grill. Your ideal location is the perfect home base to experience the best of living on the spectacular Monterey Peninsula.